This Zimlet allows you to organize your inbox in a convenient and efficient way. 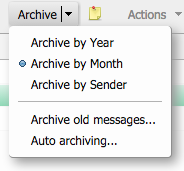 Select one or more messages to archive by month, year or sender. 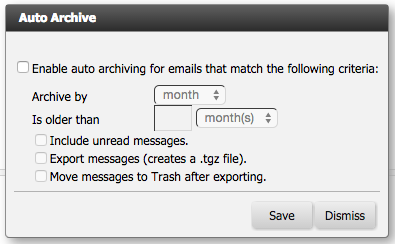 Upon enabling the auto archive option, it will run once a day. Batch archiving options apply. 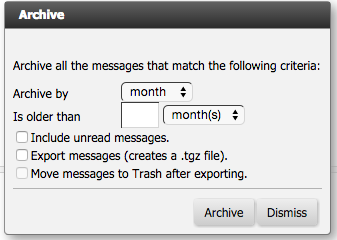 With Zimbra 8.7 only selecting one message it wil be archive, selecting more nothing do. This zimlet will help you get your inbox clean. It works for me with 8.6P4 fine. And Help with some language issues was also given. Thumbs up for translation to german and for this zimlet. Zimbra 8.0-compatible release is also available. Copyright © 2019 Zimbra. All Rights Reserved.